18-axis CNC machining centre for milling, drilling and cutting aluminium and light alloy profiles. 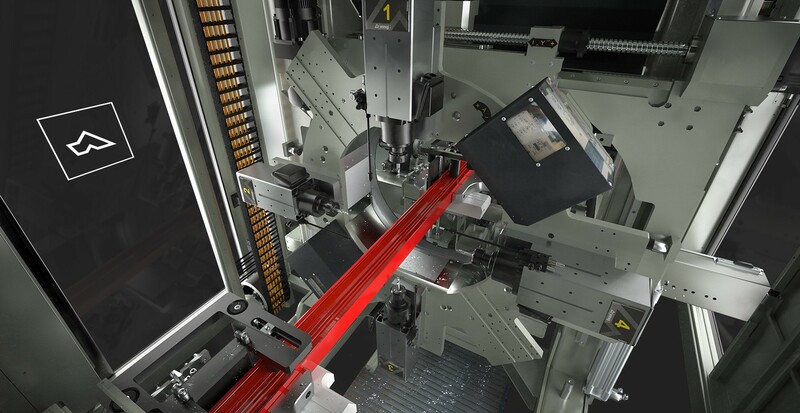 QUADRA L2 is composed of an automatic magazine and a push feed system for profiles of up to 7500 mm in length, complete with gripper drive for profile clamping. Thanks to the gripper movement, the feeder returns to its starting position simultaneously allowing the loader to prepare the next profile. The milling module, the two cutting modules and the end milling module are located in the central area of the machine. The 4-axis CNC milling module is equipped with from 4 to 6 electrospindles that make it possible to machine any face of the workpiece irrespective of its orientation. The main cutting module is composed of a 600 mm diameter blade with downstroke movement in three CNC axes. The secondary cutting module is equipped with a 350 mm diameter blade with feed and rotation movements on a horizontal CNC axis. 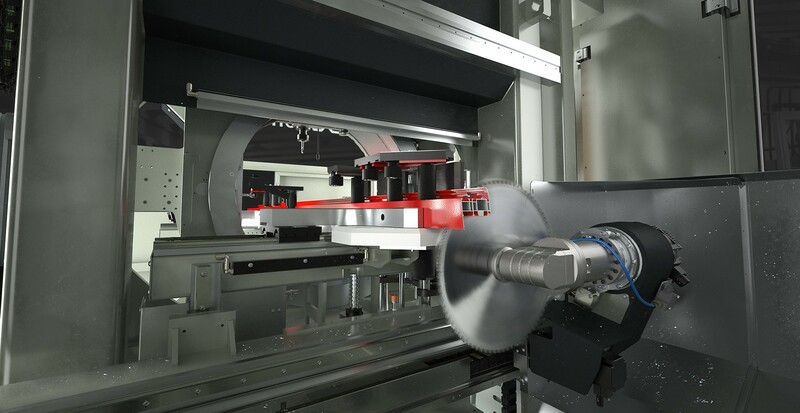 The end milling module operates on two CNC axes by means of a cutters unit. QUADRA L2 also includes an automatic ejector to transfer the workpiece from the cutting unit to the unloading magazine. The unit is composed of a transverse belts magazine to unload machined workpieces of up to 4000 mm in length (optional 7500 mm). The central machining area of the machine features a sound-proofed enclosure that protects the operator while also reducing the environmental noise impact.